Monday UPDATE UPDATE: Final numbers largely held up to estimates, with The Counselor failing to break $8M — tanktacular. Sunday UPDATE: Another box office crown for the Jackass crew. While not as prolific as their last go around, Bad Grandpa deposited a big $32M in its debut frame, dropping Gravity to second after a three-week run at the top. Its B CinemaScore suggests limited legs, though given the target demographic, the Johnny Knoxville hidden-camera comedy was largely a front-loaded venture going in. As for The Counselor, audiences wisely turned to other representation as the Ridley Scott/Cormac McCarthy abomination banked a pitiful $8M, garnering a dreadful D CinemaScore in the process. Crass is king. After unforgettable roles in gems like The Last Stand and Movie 43, Johnny Knoxville is back to his Jackass ways this weekend in Bad Grandpa, a quasi-mockumentary in the mold of Sacha Baron Cohen's Borat. While no soul over the age of 30 will be in the seats, those under that bar – specifically males – will carry Knoxville to the crown, bringing Gravity down to Earth after its ultra-impressive three-peat, the first of 2013. 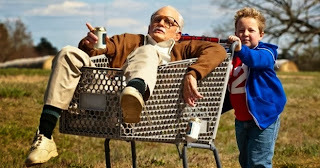 Jackass Presents: Bad Grandpa $28.5M (↑) – Won't hit Jackass 3D numbers ($117M domestic), but a debut near $30M is all but assured. Gravity $22.5M – Should break $200M stateside by Sunday, worldwide sum stands at $300M and counting. The Counselor $14M (↓) – Expecting the lowest CinemaScore ever recorded, ensuring wretched word-of-mouth for one of the worst films of 2013. Captain Phillips $10.25M – Has already doubled the total take for Tom Hanks' last project, Cloud Atlas. Cloudy with a Chance of Meatballs 2 $7.25M – Gives way to Free Birds next weekend.